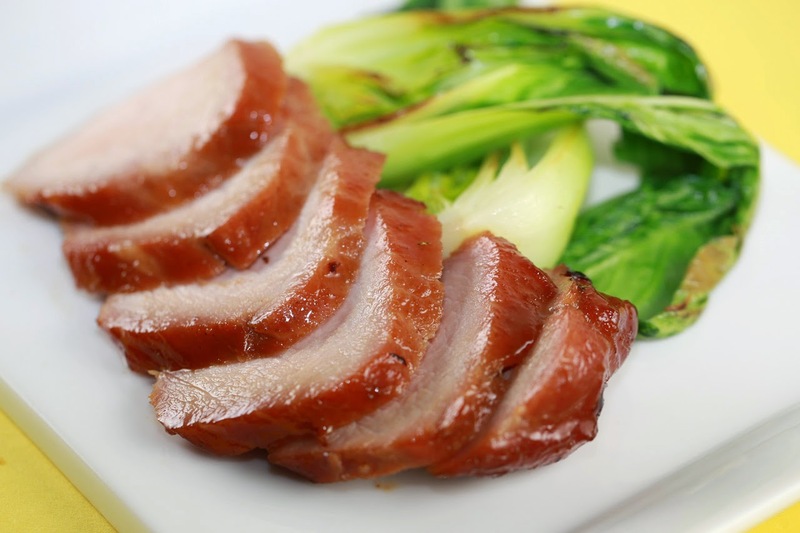 Barbecued pork is sold in many restaurants in Chinatown. However, if you don't live near a restaurant source, here is an easy recipe for making your own at home that is actually far superior. This makes more than you need for Cellophane Noodles, Mushrooms, and Barbecued Pork, but you'll find homemade barbecued pork is an excellent appetizer simply served warmed. 1. Quarter the pork lengthwise. Rub with 1 tablespoon of the sugar. Put it in a large bowl and set aside for 15 minutes. Pour off any excess liquid. In a bowl, combine the soy sauce, hoisin sauce, black soy sauce, rice wine, bean sauce, sesame oil, pepper, and remaining 1 tablespoon sugar. Pour the mixture over the pork, making sure the pork is well coated. Cover loosely with plastic wrap and refrigerate 6 to 8 hours, turning the pork from time to time. 2. When ready to roast, let the pork come to room temperature. Preheat the broiler. Put a rack in a roasting pan and add water to a depth of ¼ inch. Remove the pork from the marinade, reserving the marinade. Using your hands, evenly spread the honey on the pork. Put the pork on the rack, leaving about 1 inch of space between the pieces. 3. Carefully place the pan under the broiler (the pork should be about 4 inches from the broiler element), and broil until the meat is just beginning to char slightly, 7 to 10 minutes. Monitor the water level in the roasting pan to make sure it never falls below ¼ inch. 4. Turn the pork, brush with the reserved marinade, and broil until the meat is just beginning to char, 7 to 10 minutes, or until the pork registers 155°F when tested with a meat thermometer. If the pork is getting too charred, cover loosely with a small piece of aluminum foil. 5. Carefully remove the pork from the broiler and set on a cutting board to cool 10 minutes. Slice ¼ inch thick and serve warm or at room temperature.